…for their annual swimsuit issue. The “body image” talk is already starting. I have a question for people claiming that impressionable young girls are getting a bad body image from this doll. If girls are getting their body image from a toy….aren’t there bigger issues involved here? Should we blame the toy for that? I liked to play with GI Joe when I was younger too. Did that give me a tuff guy body image? Did I think I could become the next Jean Claude Van Damme? I am just asking. Obviously, I don’t belong to the camp that believes Barbie is the root of these so called “ body issues”. I played with Barbie, my nieces played with Barbie, my daughter played with Barbie…not a bad body image displayed in any one of them. As far as I can tell, they are happy, well adjusted , successful, articulate and confident young woman. I am not judging or invalidating anyone’s point of view here. I am simply adding my data points to this issue. Body issues aside, the folks at Sports Illustrated and Mattel have teamed up for what looks to be a fun SI issue. Here are a few stills. There is also an adorable video of the behind the scenes with veteran SI photographer Walter Loos. I had to watch it a few times just to drool over all the equipment. You have to give this guy credit…he was a really good sport about it. This entry was posted on February 12, 2014 by raberry65. 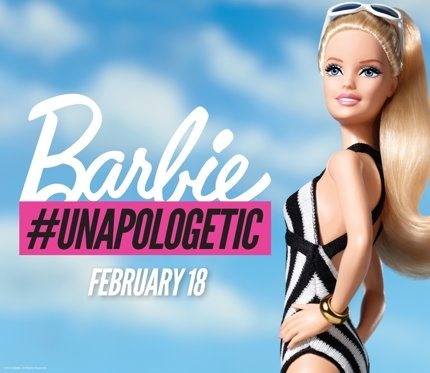 It was filed under Barbie and was tagged with 2014 Barbie, Mattel, Sports Illustrated Barbie, Unapologetic Barbie.